For Practical Action, ‘Total Energy Access’ means poor people having daily access to the energy services and supplies they need for their wellbeing. Measuring energy access needs to move beyond electricity generation and consider heat and mechanical power as equally important; it also needs to be framed in terms of energy services not just supply. 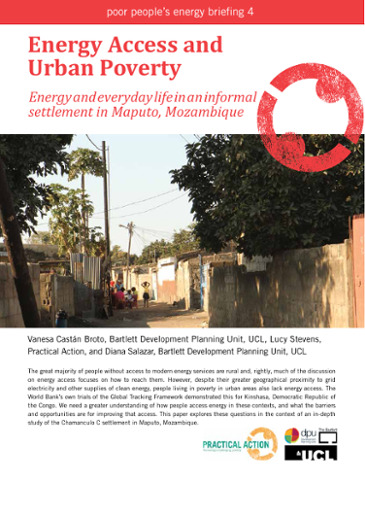 We propose that energy access should be measured across households, businesses and the community to gauge a full picture of energy use. 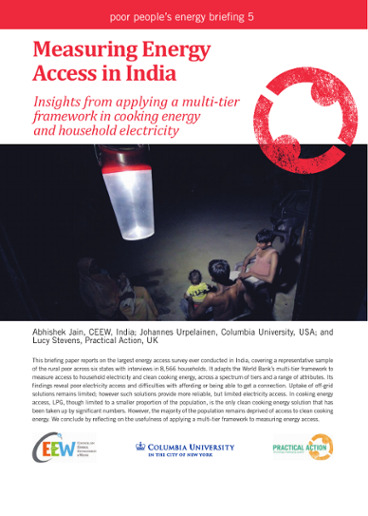 Practical Action has worked closely with the World Bank and IEA to refine our multi-tier energy access indicators. 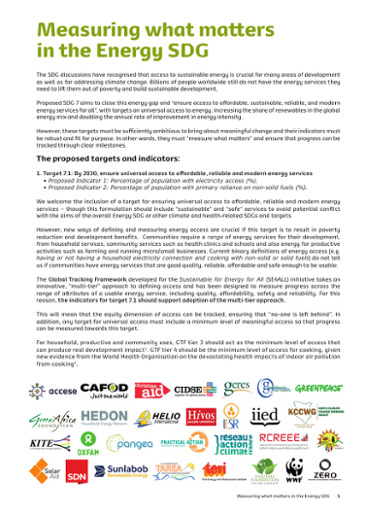 We serve on the Steering Committee of, and are providing technical input as part of, the consortium of organisations shaping the Global Tracking Framework which has now been adopted by Sustainable Energy for All (SE4ALL) to measure progress towards the goal of universal energy access by 2030. Practical Action believes that using this shared and standardised definition of energy access is likely to result in better delivery for poor communities. As such, we actively champion the Global Tracking Framework approach, encourage national governments to adopt it and public and private investment to reflect the full range of energy needs, supplies and services defined in the Framework. A greater focus on cooking and decentralised energy provision. Increased attention to whether new stoves are being used, and on the extent to which electricity supplies are able to meet energy needs. In addition, we would like to see further discussion about how minimum standards for energy services could be agreed at the national or global level, relating back to the tiers of the Framework. Practical Action welcomes the inclusion of a dedicated goal on Energy as part of the Sustainable Development Goals, which codifies the international community's commitment to "ensure access to affordable, reliable, sustainable and modern energy access for all". Setting the right indicators to measure whether this has been achieved will be crucial in setting the right incentives for the energy sector, and in whether we shift away from 'business-as-usual' towards a system that meaningfully prioritises the total energy access needs of the poor. The adoption of the Global Tracking Framework as the means of measurement, and to encourage recognition of progress up the energy access tiers. The recognition of a minimum standard for energy access at Tier 3 for household electricity and Tier 4 for cooking as part of the indicator (based on our PPEO 2010 understanding of minimum acceptable standards for energy). Greater recognition of gender inequalities, and indicators to promote, for example, gender budgeting in energy planning, and collection and analysis of disaggregated data on energy and gender.